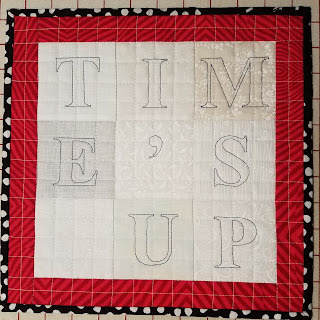 The theme for this week's Project QUILTING challenge was "A stitch in time saves nine." 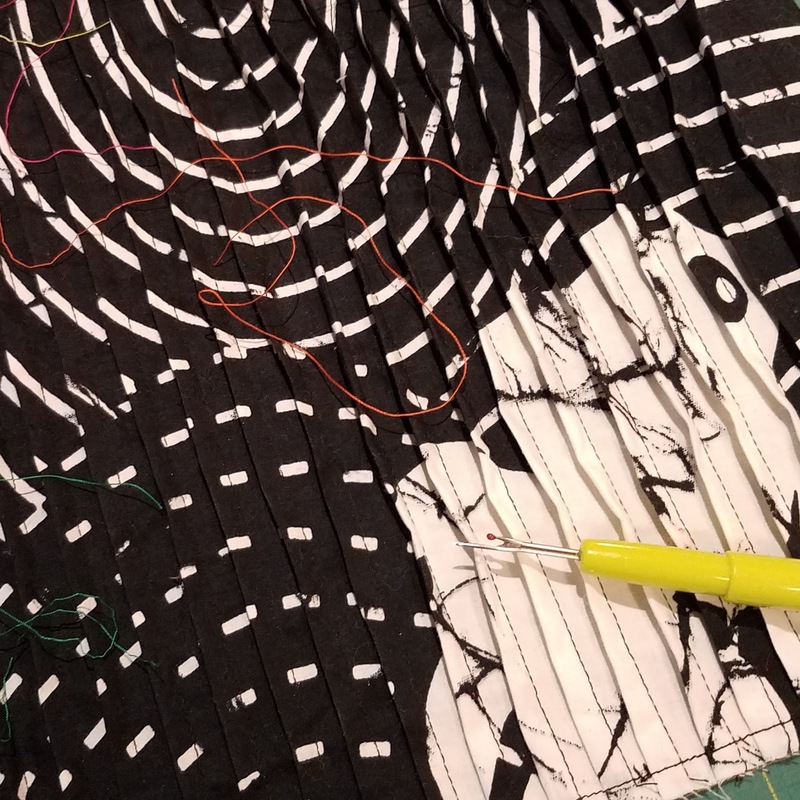 I spent a good part of the week trying to come up with a project that wouldn't bee too literal (one stitch holding the number nine on a clock) or too forced (the number nine hanging from a thread and being dropped into a piggy bank). I wasn't having luck coming up with anything until I was inspired by the challenge on this week's Project Runway All Stars. The contestants on PR were tasked with creating a red carpet look using their signature technique. One of the contestants used pintucks. 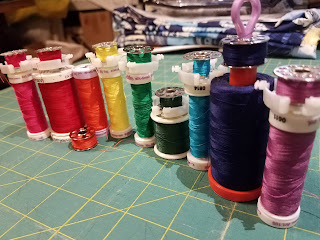 I've enjoyed working with pintucks in the past, so I decided to take my inspiration from the inspiration for Project QUILTING and do something that would involve pintucks and nine colors of threads manipulating the tucks. 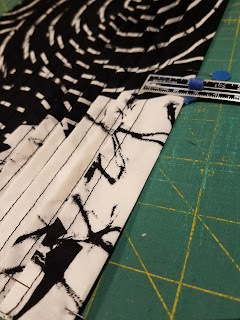 I chose a black and white Japanese print that I thought would have some interest when pintucked and would accommodate an interesting design for quilting/manipulating the tucks. 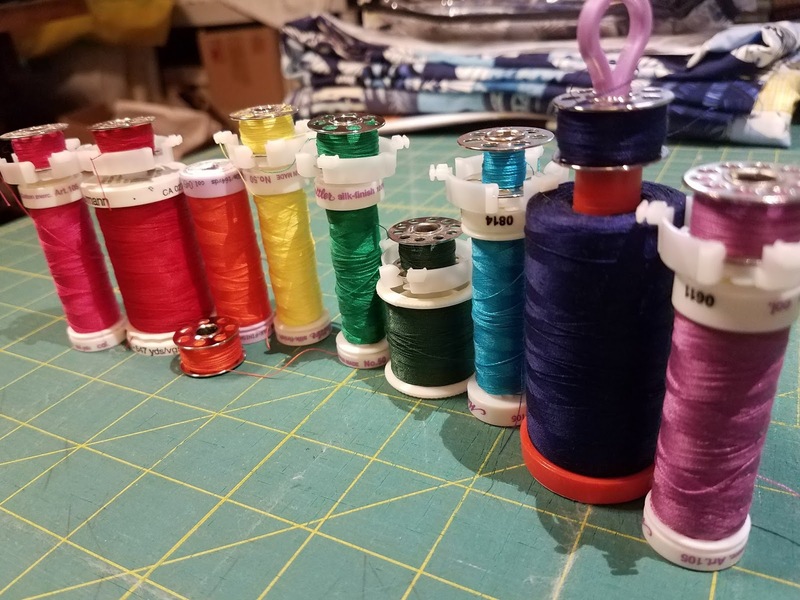 I started the pintucks and chose a selection of nine thread colors for the quilting. 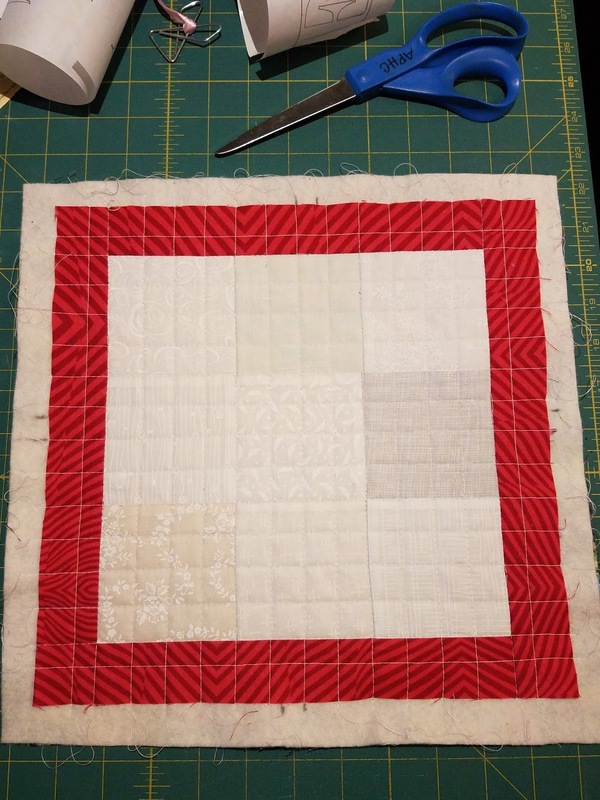 After I finished the pintucking, I assembled my quilt sandwich and tried a pattern with the quilting. I didn't like it, so I broke out the seam ripper and took it all out. I thought a bit and tried a new pattern. 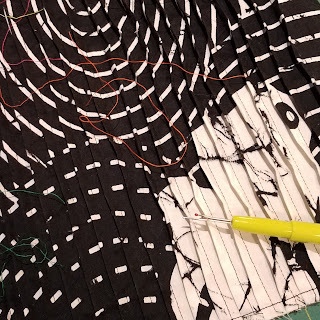 It didn't work for me either, so the seam ripper came out again. After four or five failed tries, I ceded defeat and decided to try a different design for my project. Sadly, it was Saturday afternoon with the Sunday deadline looming and I still didn't have a good idea. I ran the theme through my brain over and over, trying to land on something that would work, but wouldn't require me to stay up all night. 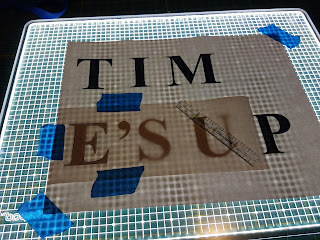 As I started to realize that I might not be able to come up with something in time, my mind landed on "Time's Up." Not only did that reflect what I was facing creatively, it has also been a timely message this year. 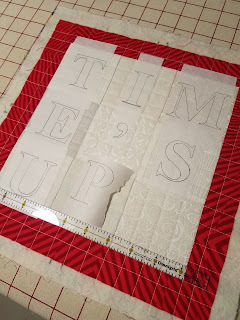 Things started to fall together and I decided to make a nine-patch of neutral squares onto which I would stitch the letters spelling out Time's Up (seven letters + one apostrophe + one space = nine). I cut squares from nine different low volume white, cream, and gray fabrics and sewed them together with a red border. I chose a simple grid pattern for the quilting, thinking that it wouldn't distract from the letters. I printed out the letters in a bold Times Roman font and used my BritePad light board to trace the letters onto freezer paper. 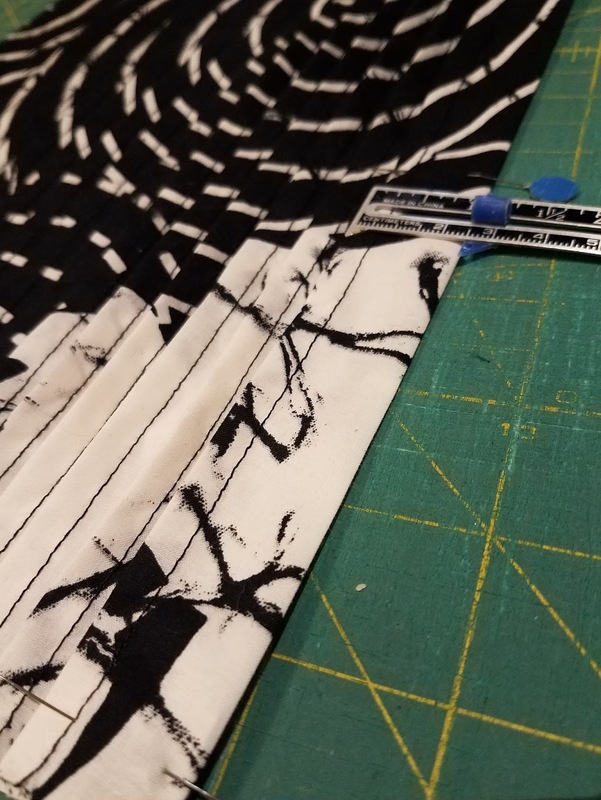 I had to take Tim Gunn's famous advice to "make it work" this week, but I'm pleased with the way my piece turned out, and I got the nine-patch stitched just in time to save myself from missing the deadline. Great result! 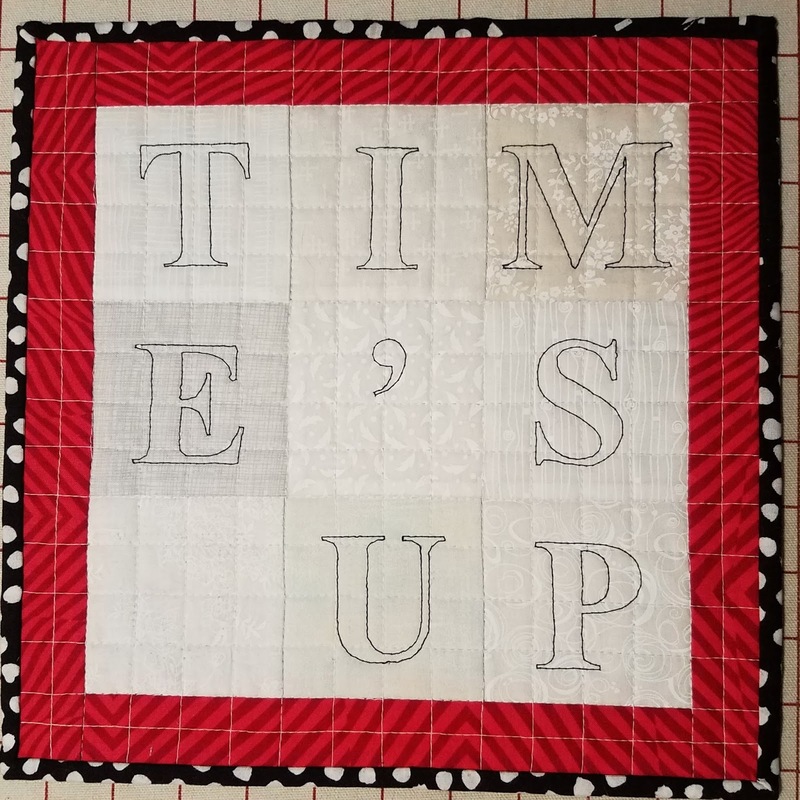 Are you also using "Time's Up" in the context of the #MeToo movement? This is their current hashtag referring to a shift from victimization to demanding change. Either way, I love the way you made it work. Thanks, Paula. Yes, I meant it to have a double meaning. You made it work perfectly. I have a pin tuck project in my ufo bin that someday I WILL make work. I feel your pain. Thanks. I've had good success in the past with pintucks, but not this time.